Member Benefits is selected to the Gator100 for third time. It is my privilege and honor to be selected to the Gator100 for the third time. There is just something extra special about being acknowledged by your alma mater. 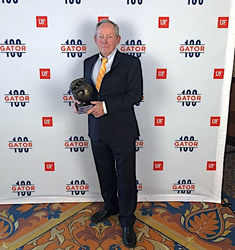 Member Benefits was named to the University of Florida’s 2019 Gator100 during a ceremony on Feb. 22 at UF’s J. Wayne Reitz Union Grand Ballroom. 3. Founded the company and been active as a member of the most senior management team from Jan. 1, 2015, through Sept. 28, 2018. Member Benefits is a technology-driven insurance brokerage and third-party administrator that focuses on benefit programs and insurance exchanges for member-based organizations. Member Benefits specializes in the design, marketing, and administration of programs for employer groups, associations, affinity groups and franchises. Member Benefits operates in many states with locations in Jacksonville, FL and Austin, TX. For more information, visit http://www.memberbenefits.com/.